Our intrepid staff of audiophiles headed out on Saturday, April 17, 2010 to our favorite record stores in Chicago to see what we could find. If you've got your own experiences to share, please let us know in the comments or drop us a line. 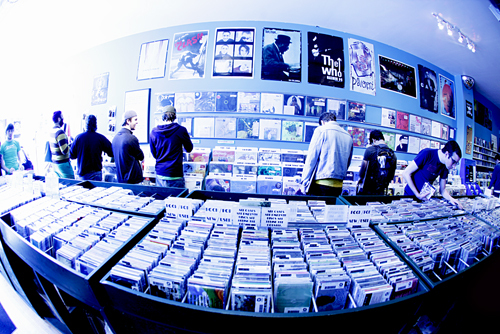 Don't forget you can share photos from Record Store Day in our Transmission Flickr group. 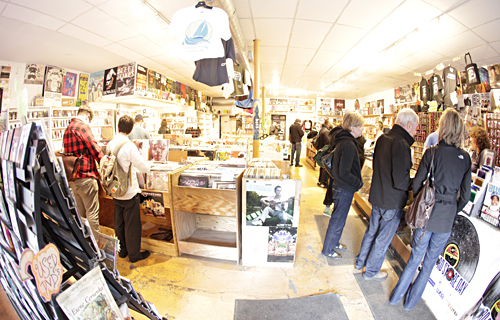 It is not surprising to know that the week prior to Record Store Day is dismal for business at many area record shops. 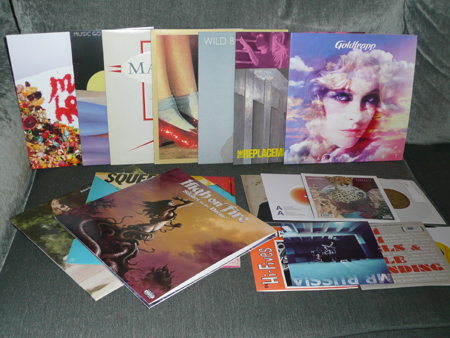 However, I'm sure every owner gladly accepts it knowing that Record Store Day provides a bounty. Each store I visited was besting normal Saturday traffic. Most were positively crowded. My Record Store Day began at midnight when Permanent opened. The nostalgic element of a midnight release party was too much for me to ignore. (Full disclosure: The first midnight release I attended was for Rage Against the Machine's Evil Empire.) At least 50 people were waiting outside Permanent Records by midnight and the line didn't let up. But their employees didn't miss a beat while peppered with rapidfire requests for the day's special releases. Those of us further back had a chance to browse the bins as we waited anxiously. Light digging all while keeping place in line yielded a few nice finds to dull the blow of special releases that sold out immediately. Everyone approached the counter with a want list and most walked away with at least a few of their desires. Goodie bags of promotional junk sweetened the deal. Saturday began with a trip to Hyde Park Records. They didn't receive any special releases, yet were still doing decent business. Within an hour, my friend and I had managed to clean them out of numerous classics we did not already own. Then it was off to Dave's in Lincoln Park for a quick browse. They were slammed and had a nice display of RSD releases behind the counter. 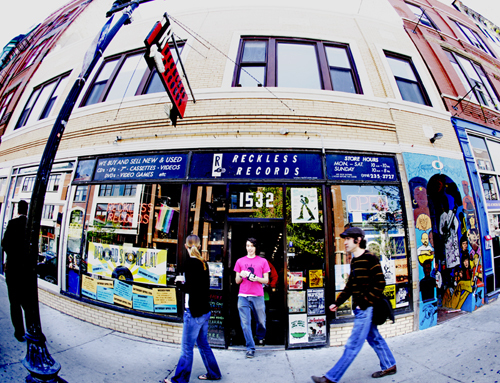 At 4, I headed over to Reckless for the Liam Hayes in-store set. I procured a few more records there, including a handful of special releases that had been either sold out or unavailable at other shops during the day. And what better way is there to wrap up Record Store Day, the endpoint of weeks of anticipation, than by going to a record release show? Not many. So the only way I could be pulled from my Record Store Day loot on Saturday was to see Disappears rock the Bottle. What a great day. Laurie's Planet of Sound (4639 N. Lincoln) always has oddball items guaranteed to make me laugh, or at least smile. By the time I got there with my shopping companion the exclusive items were almost all sold out, but there were used copies of, among other things: the soundtrack to 1988's Action Jackson, featuring the Pointer Sisters, Vanity and Sister Sledge; Eddy Murphy's eponymous 1982 album; and something called Why Mommy? Song and Rhyme Answers to Children's Everyday Questions with track titles like We Know the World is Round, Where Does the Sun Go at Night? and Why Can't I See in the Dark? While patrons perused the aisles, a lineup of musicians played in the back of the store; we got there in time to hear a few minutes of Algebro. 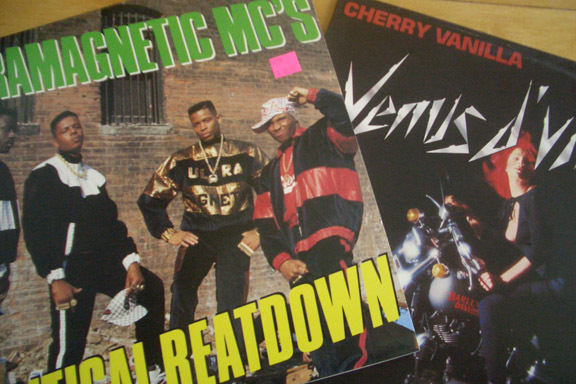 Having missed out on the exclusives, my shopping companion picked up a copy of the 1988 release Critical Beatdown by Ultramagnetic MCs. 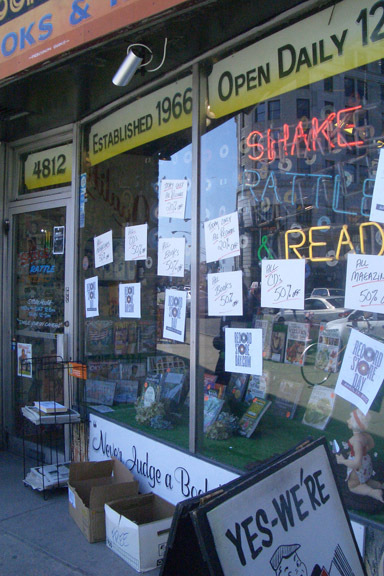 Shake Rattle & Read (4812 N. Broadway) only sells used merchandise, and the vibe on Record Store Day was as calm as always. The Cramps' Drug Train was playing as we entered the store, and there was only one other person flipping through the racks. Walking through the high-ceilinged, antique tiled space makes me feel like I've shrunk down to the size of a molecule and entered the archives of my own brain; all around the shop in bins, on shelves, and stapled onto the walls are pieces of our cultural past. If you're looking for books, everything from Mia Hamm's Go for the Goal to Marilu Henner's Total Health Makeover, and something called Famous Diamonds by Ian Balfour are for sale at a reasonable price. On the north wall of the store the paint is lighter in spots where magazines once clung to it, and the staples that held them remain. A quick scan of the magazines revealed a 1986 copy of People with Whitney Houston on the cover; a copy of Rolling Stone from the same year featuring the Bears' Jim McMahon and the headline "Chicago's Rock & Roll Quarterback"; and a 1985 issue of Interview featuring Annie Lennox. The music selection is just as eclectic, I was tempted by a copy of Martha and the Muffins' 1979 release Metro Music, but ultimately my shopping companion and I decided on Cherry Vanilla's Venus d'Vinyl from the same year. The sticker price on the album was $12, but the proprietor sold it to us for $9. As we made our purchase someone asked if he could sell his old law books to the store. "No," came the reply, "we don't have anything to do with the law here." Record Store Day was a short and sweet experience for me this year. I had a late start and knew that it was going to be low key. As soon as I hit Broadway from Diversey I saw the trademarked yellow bags from Dave's Records all over the place. It was 2:00 and I was super surprised that people were still celebrating. The cupcakes were all gone and the crowds had left by the time I arrived, but there were still a few people checking out the goods and talking to Dave about their finds. I picked up Arthur Russell's Calling Out Of Context LP reissue and was very happy to have a yellow bag of my own to rejoin brethren out on the streets. I then headed up to Reckless on Broadway just in time to catch Graveyard Train, a CCR cover band who were as completely energetic. I enjoyed them so much that a woman asked me if I knew them. She was the proud mother of the drummer I soon learned. Reckless was hopping and filled with people. A pretty copy of Fragments From A Work In Progress, a 4-CD compilation, made its way in my hands and I left with a new appreciation for the joy of Record Store Day. 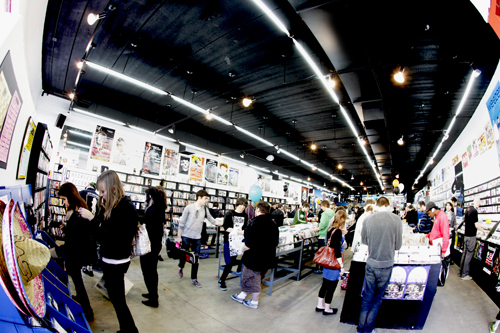 You would have never known it was Record Store Day in Logan Hardware where we started our day. There was only one other person in the store and they had no signage. We later heard that Reckless' downtown location had some copies left of The Flaming Lips' Dark Side of the Moon vinyl, so we made our way there and arrived just in time for an in-store performance from Love of Everything (pictured, below). We also picked up a free 7" cover of Bowie's "Boys Keep Swinging" from local group Mr. Russia who also happened to be playing a special show at Beat Kitchen that night celebrating RSD and the release of the 7". Our beagle must have heard it was Record Store Day too, because when we got home from our shopping trip we discovered she was doing some shopping of her own in our stereo cabinet!! This year was my second official celebration of Record Store Day, but I realized sometime last week that I'd unwittingly told my mom in Virginia that this would be a perfect weekend for her to visit. So, yep, after hosting a small brunch with some friends who also know my mom from my college days, I gathered up my bags and my mother and took off down Ashland Avenue to Dusty Groove and then on to Permanent Records. I was kind of interested in how my mom would take to possibly the most geeky of holidays for collectors (well, after the Hallmark ornament release day in July. You do not want to get in the way of those people). I asked and she couldn't remember the last time she'd visited a record store past the occasional perusal of the CD section of Barnes and Noble. Both I and my brother are huge music dorks, but my mom usually lets us buy our own stuff or maybe will order something from Amazon for us at Christmas. But, ever the supporter of local businesses, and an appreciator of good music, she gladly came along. We started out at Dusty Groove. A store I love, plus one that I thought my mom would appreciate. She went immediately for the jazz CD bin and started collecting some great stuff for her stereo at home and in her car for longer highway drives. The $.99 used Pavarotti collection CD was her best value of the day. Other gems included a great Nina Simone Japanese import and Oscar Peterson Plays the Jerome Kern Song Book CD. We both picked up a free Reggae Anthology sampler from VP Records, and I got some great Record Store Day finds (easily available even at 1pm that afternoon) including the Charlotte Gainsbourg 7", the Passion Pit 7", and Drive-By-Truckers 7". I also picked up the Devo full-length reissue of Duty Now for the Future and "Fresh" 12" single, and the special Doc Watson release. My favorite of the day is the Sharon Jones and the Dap Kings "Money" 45 (cause really, I'd prefer to call this one a "45" than a 7") split with "Day Tripper" by The Budos Band from Daptone. My mom, spinning the wheel of chance at Dusty Groove, lucked into the Dave Matthews Band 7" — one of her favorites — our hometown heroes from Charlottesville, VA (and one I will digitize and send to her, as she's lacking a turntable. Aw, shucks). We went on to Permanent Records, where the staff looked a little wrung out by the early afternoon. I wonder if they got any sleep after their midnight preview? I didn't see any special releases I was after, but by then it was 2pm, and I was content with what I'd scored at Dusty Groove. I perused the CD racks and walked away with a new copy of the 13th Floor Elevators debut album and some great Nigerian Afro pop as well as a CD called Midwest Funk: Funk 45s from Tornado Alley. I immediately dropped this into the CD player in my car and my mom and I grooved all the way back home where we got to enjoy the afternoon sun in my living room. We both layed out our scores, started tearing off the wrappers, and dropping them in the stereo one by one. Probably the geekiest bonding I've done with my mom since I can remember, but an all around good time was had by all. This is a great round-up - thanks! I visited Laurie's late in the afternoon - it didn't even occur to me to ask if there were any RSD specials, though I'm sure they were all gone by then. I got "The Warriors" on DVD (last year it was "Sergeant Pepper's Lonely Hearts Club band" - yes, the movie with the Bee Gees *and* Peter Frampton) and the new Sharon Jones/Dap Kings album on CD. I need to get a record player.